We have had summers when I run a tight ship with lots of activities, crafts, and creative snacks. Those years were wonderful, however, I often felt like a cruise director trying to keep up with everything. It seemed like I was always running out to the store for a missing ingredient or some type of craft supply. I would spend hours planning and organizing and the kids would finish the craft, activity, or snack in about 20 minutes, 10 if it was my lucky day. We have also had summers when I throw caution to the wind and the schedule out the window. It was fun to be completely lazy and schedule free for about a week. After that everyone had horrible attitudes and constantly complained. Why? They (and myself) were bored to tears. So this summer we are going to go for the middle of the road. 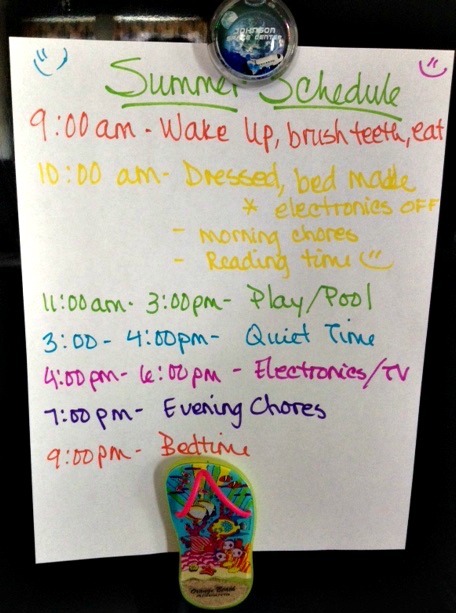 I have come up with a schedule but it is going to serve more as a guide and not a time clock. I went over the schedule with the kids because I always have better results when they have "bought in" to a new idea. They only had one complaint. Look at the schedule and see if you can pick it out. Did you find the issue? If you guessed "Quiet Time" you got it right. My middle child seems to be having the most issue with this. He said he never knew an hour could be sooooo loooooong. :) I reassured him it was not nap time. He would be able to read a book, play with his toys, just about anything as long as it was in his room. The kids don't know this but I was just trying this out to see if I liked it. Let me tell you this much, I LOVE IT! My youngest stopped napping at two years old and she is now five. So it has been a long time since I have had any type of quiet time in our house. I think I may keep it up during the school year. Everyone can benefit from an hour of quiet. We did it! We finished our 2014-2015 school year!!! I am beyond proud of our kids and how hard they worked this year. I thought about writing a long post about the various field trips, activities, and lessons from the year. I was thinking it could be kind of like a year in review. BUT it is five minutes into our summer and we are ready to celebrate. We have plans to eat our for lunch with Nana (my mother-in-law) and just got a call from Daddy that he is also going to meet us. It doesn't get better than that!!! To end our year, I took fun pictures of the kids. They are so excited to end their current grade and think about the next. It is starting to feel like he will be moving out tomorrow… This growing up thing is happening way too fast. Once again, those dimples and blue eyes get me every time. We opened our school year with a prayer and we closed it with a prayer. After the prayer, we huddled together with our hands piled on top of each other, counted to three, and shouted, "SUMMER!!!" As you can imagine our kids were instantly interested in this odd looking contraption. I promised them we would make tortillas and that is exactly what we did. I found a great recipe on Pinterest at The Mama's Girls blog(click here for recipe). Now I grew up making yeast breads and cinnamon rolls so I was curious to see if the tortillas were more or less work. The dough is super simple and other than the time to roll and press each tortilla, I found the process to be very easy.